Front yard landscaping 3 has some more great ideas for you to see. We hope you find some inspiration to build your very own dream yard. We've been venturing out to some new cities and towns to find some great ideas for you. 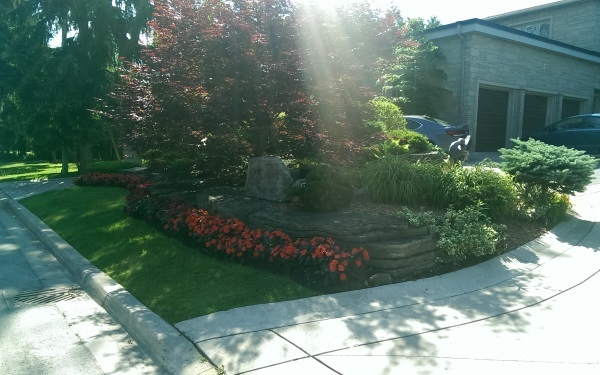 We have front yard landscaping pictures from newer suburbia areas as well as some older more established areas to provide some variety. Don't forget to check out some of our other pages as we have been building our photo gallery with hundreds of new pictures on the way this summer. 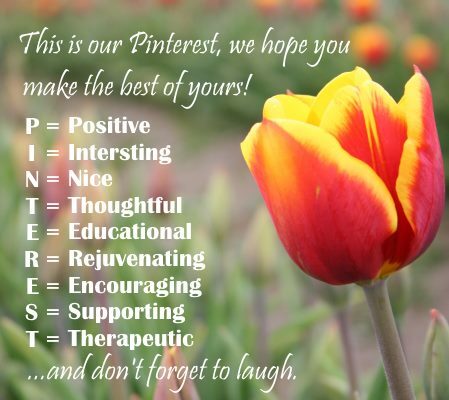 You can also follow us along with nearly 200,000 others on Pinterest where we have over 16,000 great landscaping pictures categorized on over 80 different boards. 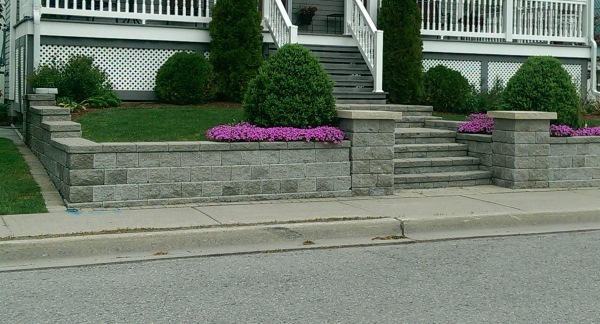 Even a small front yard can still have a little curb appeal along the sidewalk. A simple one tiered stone wall dresses up a front porch on this older home. and non-native plants. It is all "meant" to be. A front garden bed inside a small brick retaining wall is a great way to dress an awkward little corner on a small budget. It gives life to the front of this house while softening up the brickwork. This front yard large stone block wall makes a beautiful planter bed for this cottage. It provides a nice view from the gazebo that overlooks the lake. A stone block retaining wall and steps lead to the porch of this small sloped front yard. 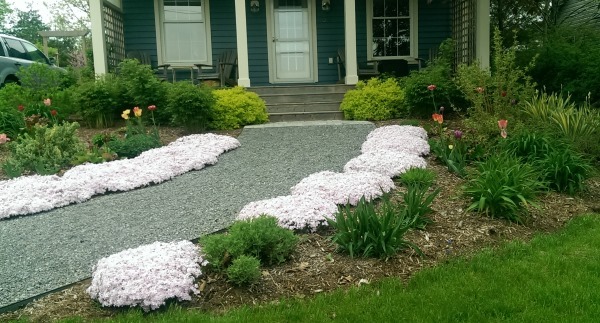 A simple mulched bed looks tidy alongside this interlock brick driveway. A simple way to deal with a small slope. 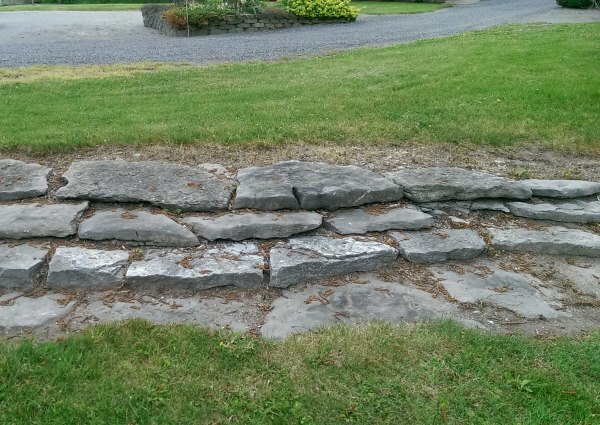 Stone steps are much easier to build than most people think. 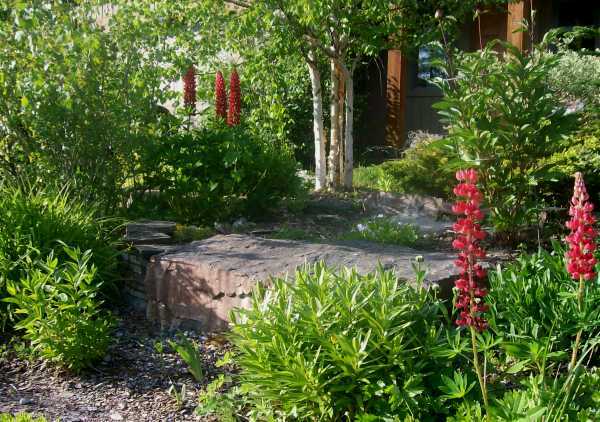 A simple front yard design using large blocks makes a nice single tier garden bed. 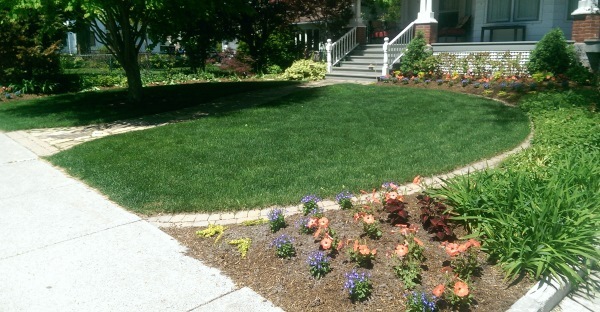 A simple way to define up a front yard circular garden bed with a border of mow over bricks. 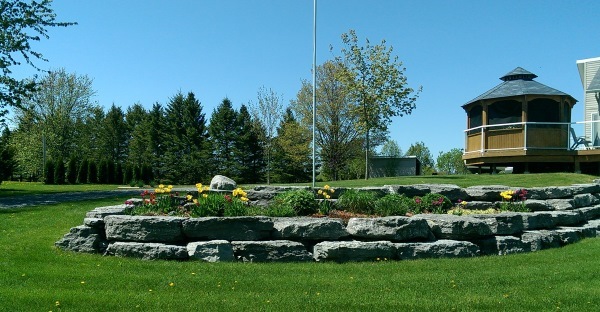 A huge front lawn is broken up by a long rock garden of erratic boulders. The two trees add a dimension of height to the wide yard. 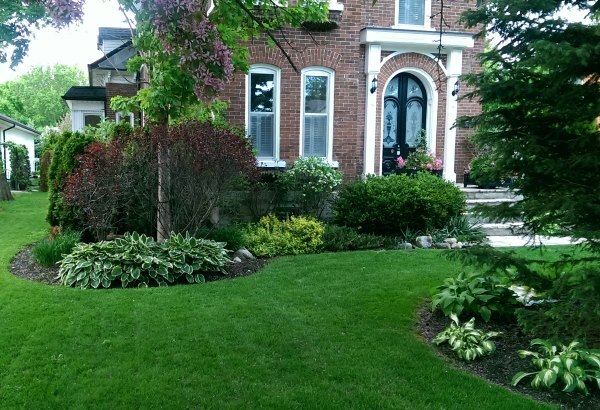 An older home with a well manicured lawn weaving through front yard garden beds. 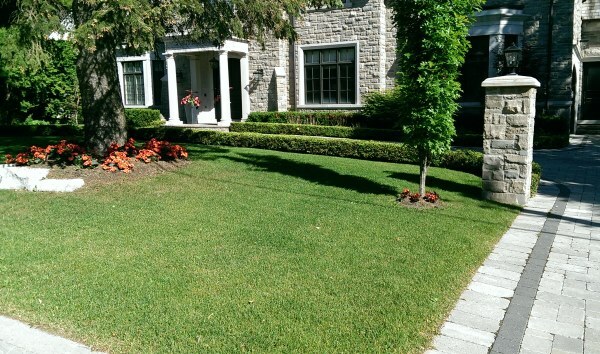 Some low hedges provide nice lines and form in this simple front yard design. 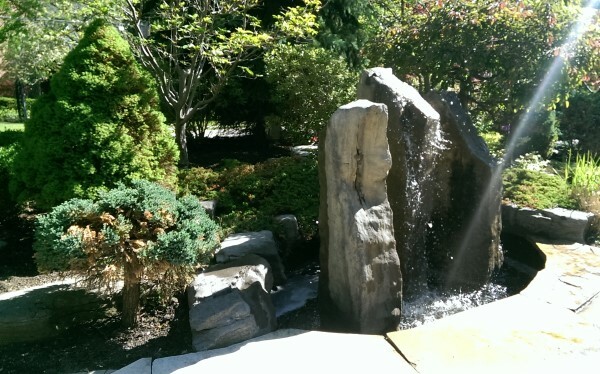 A freestanding water feature is a nice way to welcome visitors to your home. 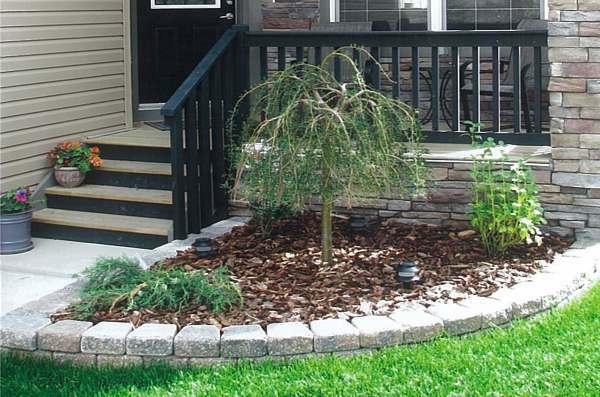 A nicely designed front garden bed with more emphasis placed on form than colour has great curb appeal. How to avoid the biggest mistakes made by DIYers, designers, and landscaping companies. Thank you to our Dream-yard Followers.